For other uses, see Telluride (disambiguation). A view of a mountain while driving above Telluride on one of its many trails. The town of Telluride sits in the valley. Near the left of the picture is Bridal Veil Falls, with the Generator Station on the cliff above. Telluride sits in a box canyon. Steep forested mountains and cliffs surround it, with Bridal Veil Falls situated at the canyon's head. Numerous weathered ruins of old mining operations dot the hillsides. A free gondola connects the town with its companion town, Mountain Village, Colorado, at the base of the ski area. 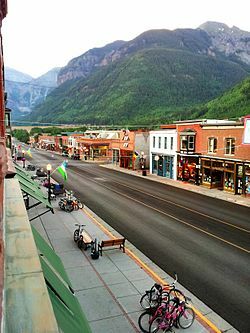 Telluride and the surrounding area have featured prominently in popular culture, and it is the subject of several popular songs. It is especially known for its ski resort and slopes during the winter, as well as an extensive festival schedule during the summer. 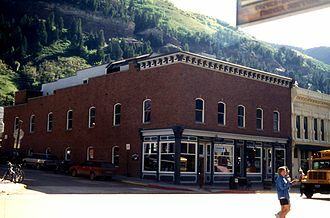 The Telluride Historic District, which includes a significant portion of the town, is listed on the National Register of Historic Places and is also one of Colorado's 20 National Historic Landmarks. The town population was 2,325 in the 2010 United States Census. 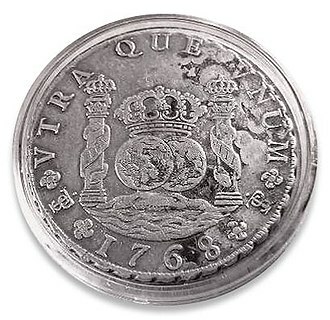 Gold was first discovered in Colorado near present-day Denver, setting off the Pike's Peak gold rush of 1858. The Smuggler gold vein above Telluride, and placer gold in the San Miguel River, were discovered in 1875.:51,54 John Fallon made the first claim in Marshal Basin above Telluride in 1875 and early settlement of Telluride followed. The town itself was founded in 1878. Telluride was originally named "Columbia", but due to confusion with Columbia, California, the name was changed by the post office in 1887. The town was named after valuable ore compounds of the chemical element tellurium, a metalloid element which forms natural tellurides, the most notable of which are telluride ores of gold and silver. 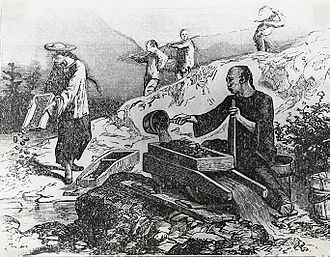 Although gold telluride minerals were never actually found in the mountains near Telluride, the area's mines were rich in zinc, lead, copper, silver, and ores which contained gold in other forms. Telluride began slowly because of its isolated location. In 1881, a toll road was opened by Otto Mears which allowed wagons to go where only pack mules could go before. This increased the number of people in Telluride, but it was still expensive to get gold-rich ore out of the valley. 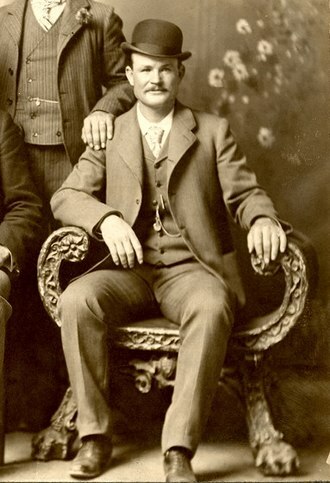 In June 1889, Butch Cassidy, before becoming associated with his gang, "the wild bunch", robbed the San Miguel Valley Bank in Telluride. This was his first major recorded crime. He exited the bank with $24,580, and later became famous as a bank robber. In 1891, the Rio Grande Southern railroad, also begun by Mears, arrived in Telluride, eventually building a two stall engine house, water facilities, a section house and a bunkhouse, sidings and a depot. 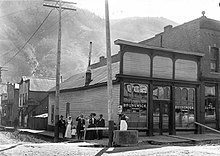 It continued further up the valley to end its Telluride branch at Pandora, serving the mines and the town until 1952. 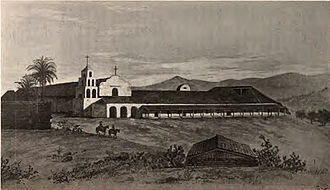 The cheaper and consistent transportation for passengers and freight allowed miners and goods to flow into the San Miguel town and ore to flow out to the mills and foundries elsewhere. This brought a brief but unprecedented boom to Telluride before the Panic of 1893. Around the turn of the 20th century, there were serious labor disputes in the mines near Telluride. The Colorado National Guard was called out and there were deaths on both sides. Unions were formed as miners joined the Western Federation of Miners in 1896. 1899 brought big changes as union strike action led most mines to grant miners $3 a day for an 8-hour day’s work plus a boarding pay of $1 a day. At this time, workers were putting in 10- to 12-hour days and the mines ran 24 hours a day. Work conditions were treacherous, with mines above 12,000 ft, a lack of safety measures, and bitter weather in winter months. Even the boarding houses were precariously placed on the mountainsides. Telluride's labor unrest occurred against the backdrop of a statewide struggle between miners and mine owners. Bulkeley Wells was one mine operator considerably hostile to the union. The Telluride Miners' Union was led by Vincent St. John. The disappearance of mine guard William J. Barney, which Wells declared a "murder", created much intrigue and national interest. The accusations, animosity, gunplay, and expulsions which followed were part of an ongoing struggle throughout Colorado's mining communities which came to be called the Colorado Labor Wars. In 1891, Telluride's L.L. Nunn joined forces with George Westinghouse to build the Ames Hydroelectric Generating Plant, an alternating current power plant, near Telluride. (Nunn's home can be found at the corner of Aspen and Columbia Streets; next door is the home he purchased for the "pinheads" to study hydro-electric engineering.) The plant supplied power to the Gold King Mine 3.5 miles away. This was the first successful demonstration of long-distance transmission of industrial-grade alternating current power and used two 100-hp Westinghouse alternators, one working as a generator producing 3,000 volt, 133 Hertz, single-phase AC, and the other used as an AC motor. This hydroelectric AC power plant predated the Westinghouse plant at Niagara Falls by 4 years. Nunn and his brother Paul built power plants in Colorado, Utah, Idaho, Montana, Mexico, and the Ontario Power plant at Niagara Falls on the Canadian side. Nunn developed a keen interest in education as part of his electrical power companies, and in conjunction with Cornell University built the Telluride House at Cornell in 1909 to educate promising students in electrical engineering. 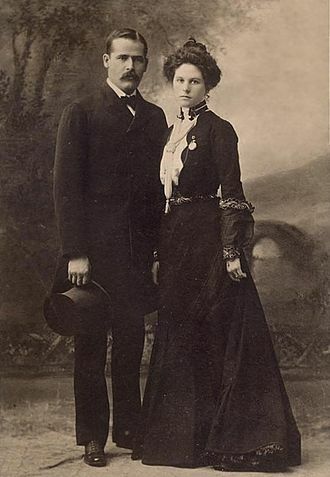 Later, Nunn along with Charles Walcott, started the non-profit Telluride Association. Nunn founded Deep Springs College in 1917. All of Nunn's educational endeavors are going strong today. Each year, the Telluride Tech Festival honors Nunn, inventor Nikola Tesla, and Westinghouse, along with current day technology and science leaders. Telluride's most famous historic mines are the Tomboy, Pandora, Smuggler-Union, Nellie, and Sheridan mines. Beginning in 1939, the hard-rock mining operations in the Red Mountain and Telluride mining districts began a lengthy consolidation under the Idarado Mining Company (Idarado), now a division of Newmont Mining. The consolidation ended in 1953 with Idarado’s acquisition of the Telluride Mines. Idarado kept the underground workings and mill operations open at Telluride’s Pandora hard-rock mine until 1978. When the mine officially closed, the snow which tormented Telluride's miners became the town's new source of income, in the form of skiing and tourism. The documentary video "the YX factor" chronicles the transition from mining to skiing and the influx of "hippies" in the late 1960s and early 1970s in the words of local residents and commentators such as Peter Yarrow and Tom Hayden. Aerial view of newly cut Boomerang Road (May 1972). Mining was Telluride’s only industry until 1972, when the first ski lift was installed by Telluride Ski Resort founder Joseph T. Zoline and his Telluride Ski Corporation (Telco). Zoline bought the land for the future resort in 1969 and began to craft the slopes. Along with his mountain manager, Telluride native Bill "Sr." Mahoney, they slowly and thoughtfully put together a plan for sustained development of Telluride and the region. As mining phased out and a new service industry phased in, the local population changed sharply. Mining families fled Telluride to settle in places like Moab, Utah, where uranium mining offered hope of continued employment. Mining families were replaced by what locals referred to as "hippies", young people with a 1960s worldview that often clashed with the values of Telluride's old-timers. These newcomers were characterized as idle "trustfunders" drawn to the town for a casual lifestyle and outdoor excitements such as hang gliding, mountain climbing, and kayaking. The new population opposed town growth and economic expansion, including growth due to tourism and skiing. At one point, a serious effort was made to ban cars from the city limits and force visitors to use horse-drawn carts. The 1970s had fluctuating snowfalls and economic recession, but the town’s now famous music and film festivals flourished. They exposed hundreds of thousands to the grandeur of the valley for the first time and created iconic associations with elite entertainers. Meanwhile, ski area founder Joe Zoline worked to develop one of the best mountains in North America for expert skiers and created infrastructure for tourism that respected Telluride's need to stay small and beautiful. As the final ore carts were rolling out of the Pandora mine, tourists began to discover Telluride's magnificent views, expert skiing, and famous autumn color changes. After the brutal snow drought of 1976 nearly wiped out the embryonic ski and lodging industry, the town started to rebound economically. In 1978, Ron Allred and his partner Jim Wells bought a stake of the ski area to form the Telluride Company. They expanded the infrastructure by adding a gondola connecting Telluride with the Mountain Village. During the 1980s, Telluride developed a reputation as "Colorado's best-kept secret", which paradoxically made it one of the better-known resort communities. Wealthy skiers flocked to the mountain all winter, and sightseers kept hotel rooms full all summer. Telluride also became notorious in the drug counterculture as a drop point for Mexican smugglers and a favorite place for wealthy importers to enjoy downtime. The town was even featured in the hit song by Glenn Frey from Miami Vice, "Smugglers Blues". Telluride was living up to its Wild West history. This type of attention helped differentiate it from Aspen. The festivals and Telluride's bad-boy image attracted celebrities like Tom Cruise, Oprah Winfrey, and Oliver Stone. By the mid-1990s, Telluride had shed both its mining personality and drug image to establish itself as a premier resort town balancing modern culture with fascinating western history. In 2003, Prospect Bowl, an extension to the ski area opened, providing the resort with many new trails and runs. In 2007–08, the ski area opened some of the most extreme, in-bound, hike-to terrain in the country. Most lifts in the area are high-speed quad chairs capable of holding four passengers. The highest lift on the mountain reaches 12,570 feet. Telluride from a gondola ascending to Mountain Village. Telluride has a free box that is well supported by the community. Telluride has an elevation of 8,750 feet (2,670 m) in an isolated spot in Southwest Colorado. From the west, Colorado Route 145 is the most common way into Telluride; two other passes enter the town, Imogene Pass and Black Bear Pass. On the eastern side of town, there are two waterfalls: Ingram Falls, which is visible from town, and Bridal Veil Falls and the Bridal Veil Hydroelectric plant, which are just out of sight from town to the right of Ingram. The power plant house was leased for a period of time by Eric Jacobsen, who restored the house and the generator inside. The hydroelectric plant was built in 1895 to power the Smuggler-Union Mine. The town is served by air transportation via Telluride Regional Airport (TEX), once the highest elevation commercial airport in the United States at 9,070 feet. The airport is considered challenging by pilots because of frequent adverse weather conditions, high elevation, and the extremely rugged mountain terrain surrounding the airport on nearly all sides. Major airline service is provided seasonally into Montrose (MTJ), approximately 70 miles (110 km) north by road. In the town, the population was spread out with 14.3% under the age of 18, 12.2% from 18 to 24, 50.9% from 25 to 44, 20.8% from 45 to 64, and 1.9% who were 65 years of age or older. The median age was 31 years. For every 100 females, there were 122.8 males. For every 100 females age 18 and over, there were 127.4 males. The median income for a household in the town was $51,938, and the median income for a family was $66,136. Males had a median income of $35,329 versus $30,096 for females. The per capita income for the town was $38,832. About 8.5% of families and 11.5% of the population were below the poverty line, including 16.2% of those under age 18 and 6.9% of those age 65 or over. Beyond the ski lifts, Telluride is now widely recognized as an all-season resort. Telluride Ski Resort is definitely the main attraction in the winter. But when summer comes around, Telluride transforms into an outdoor recreation hot spot, with tourists visiting to enjoy mountain biking, hiking, river rafting, sightseeing and more. The Telluride Tourism Board promotes tourism in the region. Telluride features over 30 hiking trails ranging in difficulty level. Some of the more popular routes include Ajax Peak, Bear Creek Falls, Hope Lake, and Bridal Veil Falls. Hiking season begins in May and lasts until early October, with waterfalls gushing in June and wildflowers at their peak in early July. The trails range from quick and easy runs to multi-day hiking trips that reach an elevation of 14,000 feet. Nearly all the trails feature waterfalls, wildflowers, and high alpine lakes. Telluride is also home to many endurance events. The Hardrock 100, held in July, has a major aid station in the town park. The Fall Tilt, a 12-hour downhill mountain biking event, is held in Mountain Village each September. And the 40-mile Telluride Mountain Run loops the town in a wide swath that includes some of the most difficult and scenic trails in the area. Telluride is served by Telluride Regional Airport. Scheduled flight options are limited, due to the airport's somewhat short runway and frequent closures under bad weather, so most passengers going to Telluride use Montrose Regional Airport, 67 miles to the north. Free public transportation is provided in Telluride. The bus system, called Galloping Goose, makes a complete loop around the town and the Gondola links Telluride with Mountain Village. The Galloping Goose loops around every 20 minutes from 7 am to 9 pm. It stops at major locations such as the Gondola, the Post Office, and the Courthouse. The Galloping Goose also has another bus that goes to Lawson hill and Norwood. Telluride's free Gondola is the only one of its kind in North America. It stops at three stations: Telluride, San Sophia, and Mountain Village. It is a 13-minute ride and reaches an elevation of 10,540 feet at the San Sophia station. 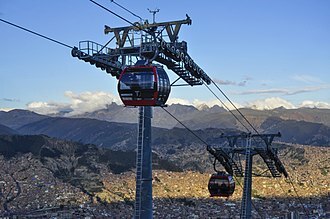 The gondola cabins feature bike and ski racks for recreational use. There are also pet-friendly and handicap accessible cabins available. The Gondola is open from 6:30 am to midnight during summer and winter season. It closes for six weeks during the off-season. State Highway 145 is part of the San Juan Skyway. It connects Telluride to Cortez and Naturita. This road also gives access to State Highway 62, the main route to Denver, Montrose and other important places in Colorado. There are two alternate passes to enter the town: Imogene Pass and Black Bear Pass (both require high clearance or four-wheel-drive vehicles). The movie The Hateful Eight by Quentin Tarantino conducted its principal photography on December 8, 2014, in Colorado on the Schmid Ranch near Telluride. ^ "Colorado County Seats". State of Colorado, Department of Public Health and Environment. Retrieved 2007-12-31. ^ "2010 Census Interactive Population Search". United States Census Bureau, Population Division. Retrieved January 4, 2014. ^ Gruver, Mead (August 15, 2011). 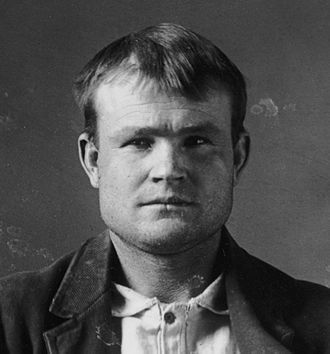 "Old text, new wrinkles: Did Butch Cassidy survive?". Associated Press. Retrieved August 15, 2011. ^ Clark, Jerry. "Telluride, Colorado – Mile Post 45.1 – Elev. 8,756ft". The Narrow Gauge Circle. Mark L. Evans. Retrieved 19 May 2013. 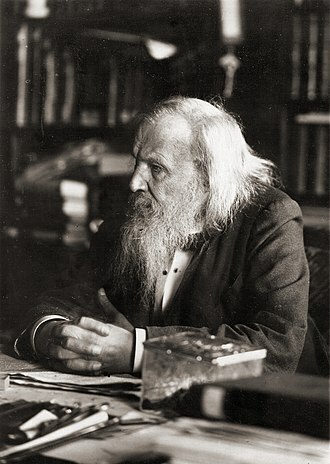 ^ a b Mattox, D. M. (15 January 2013). 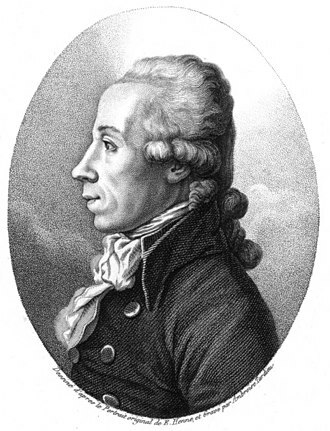 "The Foundations of Vacuum Coating Technology". Elsevier Science. Retrieved 26 March 2018 – via Google Books. ^ Waring, Lise (June 9, 2010). "The Free Box Provides". The Huffington Post. ^ "Aspen, Telluride make list of America's most white-knuckle airport landings". 20 March 2017. Retrieved 26 March 2018. ^ Telluride.com. "Hiking and Running". www.telluride.com. 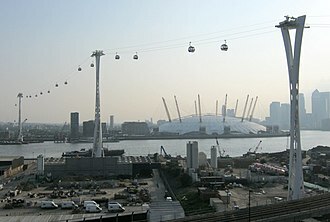 ^ "Gondola". Telluride.com. Retrieved 2016-01-02. ^ "Quentin Tarantino Starts Shooting 'Hateful Eight'". Variety. Retrieved 5 January 2016. 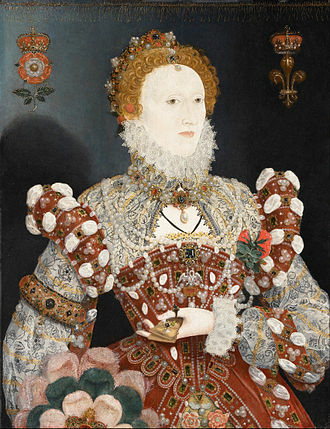 Barbour, Elizabeth (1999). Images of America: Telluride. San Francisco, CA: Arcadia Publishing. ISBN 0-7385-4850-2. Benjamin, Eileen (2000). Telluride: Landscapes and Dreams. Telluride, CO: Montoya Publishing. ISBN 0-9679986-0-3. Buys, Christian J. (2003). A brief history of Telluride. Montrose, CO: Western Reflections. ISBN 1-890437-83-2. Buys, Christian J. (2006). Historic Historic Telluride in rare photographs. Ouray, CO: Western Reflections. ISBN 1-890437-02-6. "The Idarado Legacy" (PDF). Denver, CO: Idorado Mining Company, subsidiary of Newmont Mining Corporation. 2006. Archived from the original (PDF) on 30 October 2008. Lavender, David (1999). The Telluride Story. Photography by George H. H. Huey. Ouray, CO: Wayfinder Press. ISBN 0-9608764-6-4. Martin, MaryJoy. The Corpse On Boomerang Road: Telluride's War on Labor 1899–1908. Montrose, CO: Western Reflections Publishing Company. ISBN 1-932738-02-9. Pera, Davine (2000). Conversations at 9,000 feet : a collection of oral histories from Telluride, Colorado. Ouray, CO: Western Reflections. ISBN 1-890437-53-0. Richey, Duke (2000). The mountains are the story : a history of Telluride for children. Illustrated by the children of Telluride Elementary School. Telluride, CO: Between the Covers Bookstore. ISBN 0-9706361-0-5. Smith, Duane A. (2003). A visit with the Tomboy Bride : Harriet Backus and her friends. Montrose CO: Western Reflections Pub. Co. ISBN 1-890437-87-5. A metalloid is any chemical element which has properties in between those of metals and nonmetals, or that has a mixture of them. 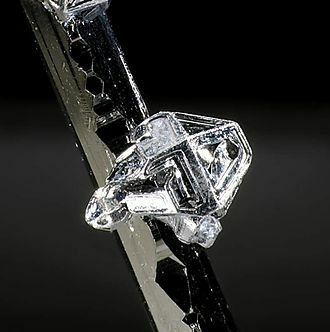 There is neither a standard definition of a metalloid nor complete agreement on the elements appropriately classified as such, despite the lack of specificity, the term remains in use in the literature of chemistry. The six commonly recognised metalloids are boron, germanium, antimony, five elements are less frequently so classified, aluminium, selenium and astatine. 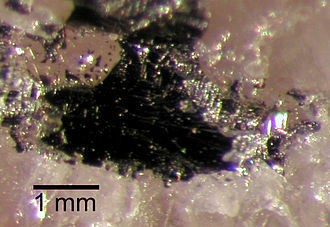 Typical metalloids have an appearance, but they are brittle. Chemically, they behave mostly as nonmetals and they can form alloys with metals. 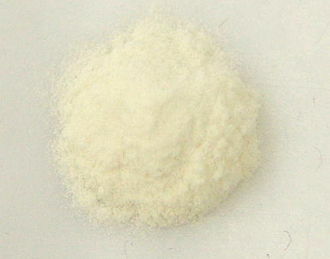 Most of their physical and chemical properties are intermediate in nature. Metalloids are usually too brittle to have any structural uses and they and their compounds are used in alloys, biological agents, flame retardants, optical storage and optoelectronics, pyrotechnics and electronics. The electrical properties of silicon and germanium enabled the establishment of the industry in the 1950s. The term metalloid originally referred to nonmetals and its more recent meaning, as a category of elements with intermediate or hybrid properties, became widespread in 1940–1960. Metalloids sometimes are called semimetals, a practice that has been discouraged, in physics it more specifically refers to the electronic band structure of a substance. A metalloid is an element with properties in between, or that are a mixture of, those of metals and nonmetals, and which is hard to classify as either a metal or a nonmetal. This is a definition that draws on metalloid attributes consistently cited in the literature. Difficulty of categorisation is a key attribute, most elements have a mixture of metallic and nonmetallic properties, and can be classified according to which set of properties is more pronounced. Only the elements at or near the margins, lacking a sufficiently clear preponderance of either metallic or nonmetallic properties, are classified as metalloids, silicon, arsenic and tellurium are recognised commonly as metalloids. Mountain Village is a Home Rule Municipality in San Miguel County, United States, located just southwest of Telluride. The elevation of the rises above Telluride to 9,540 feet. The population was 1,320 at the 2010 census and estimated at 1,395 as of 2015, mountain Village is known for its peaceful nature and exciting ski slopes. These slopes go all the way from easy double greens to the treacherous double blacks located at the top of Coonskin Ridge, Gold Hill, mountain Village is located at 37°56′5″N 107°51′55″W. According to the United States Census Bureau, the town has an area of 3.3 square miles. The population density was 295.7 people per square mile, there were 1,022 housing units at an average density of 309.0 per square mile. The racial makeup of the town was 84. 56% White,0. 82% African American,1. 64% Native American,1. 64% Asian,0. 51% Pacific Islander,9. 61% from other races, and 1. 23% from two or more races. Hispanic or Latino of any race were 19. 43% of the population,46. 9% of all households were made up of individuals and 1. 2% had someone living alone who was 65 years of age or older. 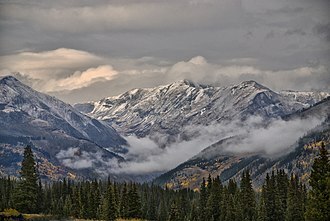 The San Juan Mountains are a high and rugged mountain range in the Rocky Mountains in southwestern Colorado, and is the largest mountain range in Colorado by area. 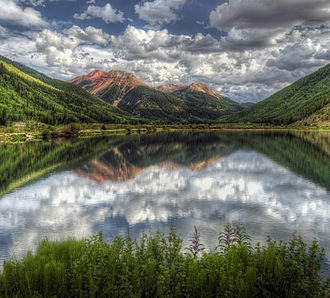 The area is highly mineralized and figured in the gold and silver mining industry of early Colorado, major towns, all old mining camps, include Creede, Lake City, Silverton and Telluride. 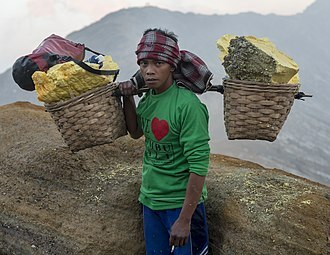 Large scale mining has ended in the region, although independent prospectors still work claims throughout the range. 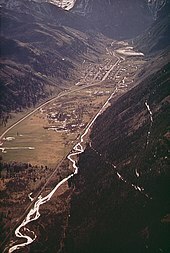 The last large scale mines were the Sunnyside Mine near Silverton, which operated until late in the 20th century, famous old San Juan mines include the Camp Bird and Smuggler Union mines, both located between Telluride and Ouray. The Summitville mine was the scene of an environmental disaster in the 1990s when the liner of a cyanide-laced tailing pond began leaking heavily. Summitville is in the Summitville caldera, one of many extinct volcanoes making up the San Juan volcanic field, one, La Garita Caldera, is 35 miles in diameter. Large beds of lava, some extending under the floor of the San Luis Valley, are characteristic of the slope of the San Juans. Tourism is now a part of the regional economy, with the narrow gauge railway between Durango and Silverton being an attraction in the summer. Jeeping is popular on the old trails which linked the historic mining camps, visiting old ghost towns is popular, as is wilderness trekking and mountain climbing. Many of the old mining camps are now sites of summer homes. Though the San Juans are extremely steep and receive a lot of snow, purgatory Resort, once known as Durango Mountain Resort, is a small ski area 26 miles north of Durango. There is skiing on Wolf Creek Pass at the Wolf Creek ski area, recently Silverton Mountain ski area has begun operation near Silverton. 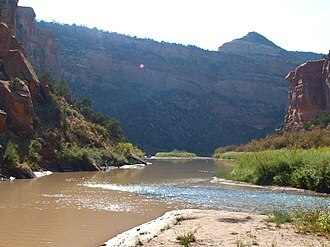 The Rio Grande drains the east side of the range, the other side of the San Juans, the western slope of the continental divide, is drained by tributaries of the San Juan and Gunnison rivers, which all flow into the Colorado River. A ski resort is a resort developed for skiing and other winter sports. In Europe, most ski resorts are towns or villages in or adjacent to a ski area – a mountainous area with pistes, ski trails, the ski industry has identified advancing generations of ski resorts, First generation Developed around a well-established summer resort or village. Second generation Created from a non-tourist village or pasture, third generation or integrated Designed from scratch on virgin territory to be a purpose-built ski resort, all the amenities and services nearby. Fourth generation or village resorts Created from virgin territory or around an existing village, the term ski station is used, particularly in Europe, for a skiing facility which is not located in or near a town or village. A ski resort which is open for summer activities is often referred to as a mountain resort. Ski areas have marked paths for skiing known as runs, trails or pistes, Ski areas typically have one or more chairlifts for moving skiers rapidly to the top of hills, and to interconnect the various trails. Rope tows can be used on short slopes, larger ski areas may use gondolas or aerial trams for transportation across longer distances within the ski area. Ski areas usually have at least a basic first aid facility, the ski patrol is usually responsible for rule enforcement, marking hazards, closing individual runs, and removing dangerous participants from the area. Some ski resorts offer lodging options on the slopes themselves, with ski-in, après-ski is a term for entertainment, nightlife or social events that occur specifically at ski resorts. These add to the enjoyment of resort-goers and provide something to do besides skiing and snowboarding, the culture originated in the Alps, where it is most popular and where skiers often stop at bars on their last run of the day while still wearing all their ski gear. People that browse ski resort & hotel websites will commonly seek mention of the quality of après-ski in the area and it is therefore seen as an important factor for skiers to consider before booking a holiday. An estimated 100,000 gold seekers took part in one of the greatest gold rushes in North American history. The participants in the rush were known as Fifty-Niners after 1859. But in fact the location of the Pikes Peak Gold Rush was 85 miles north of Pikes Peak and it was only named Pikes Peak Gold Rush because of how well known and important Pikes Peak was. The rush was exemplified by the slogan Pikes Peak or Bust, a reference to the prominent mountain at the eastern edge of the Rocky Mountains that guided many early prospectors to the region westward over the Great Plains. The prospectors provided the first major European-American population in the region, the rush created a few mining camps such as Denver City and Boulder City that would develop into cities. Many smaller camps such as Auraria and Saint Charles City were absorbed by larger camps, scores of other mining camps have faded into ghost towns, but quite a few camps such as Central City, Black Hawk and Idaho Springs survive. For many years people had suspected the mountains had numerous rich gold deposits, in 1835, a French trapper by the name of Eustace Carriere had ended up losing his party and wandered through the mountains for many weeks. During these weeks he found many gold specimens which he took back to New Mexico for examination. Upon examination, they turned out to be pure gold, but when he tried to lead an expedition back to the location of where he found the gold, they came up short because he could not quite remember the location. 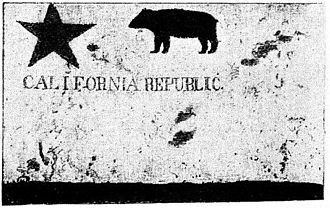 The Rocky Mountain gold failed to impress or delay men with visions of unlimited wealth in California, as the hysteria of the California Gold Rush faded, many discouraged gold seekers returned home. Rumors of gold in the Rocky Mountains persisted and several small parties explored the region, in the summer of 1857, a party of Spanish-speaking gold seekers from New Mexico worked a placer deposit along the South Platte River about 5 miles above Cherry Creek in what is today Denver. William Greeneberry Green Russell was a Georgian who worked in the California gold fields in the 1850s, Russell was married to a Cherokee woman, and through his connections to the tribe, he heard about an 1849 discovery of gold along the South Platte River. Green Russell organized a party to prospect along the South Platte River and they rendezvoused with Cherokee tribe members along the Arkansas River in present-day Oklahoma and continued westward along the Santa Fe Trail. Others joined the party along the way until their number reached 107, upon reaching Bents Fort, they turned to the northwest, reaching the confluence of Cherry Creek and the South Platte on May 23. The site of their initial explorations is in present-day Confluence Park in Denver and they began prospecting in the river beds, exploring Cherry Creek and nearby Ralston Creek but without success. The site of the discovery is in the present-day Denver suburb of Englewood, just north of the junction of U. S. Highway 285, by 1860, Denver City, Golden City, and Boulder City were substantial towns serving the mines. Rapid population growth led to the creation of the Colorado Territory in 1861, the Pikes Peak Gold Rush sent many into a frenzy, prompting them to pack up their belongings and head to Colorado. Picturesque Columbia in the autumn. Columbia State Historic Park scene. A parade is part of the annual Columbia Fire Muster, in May. Bridal Veil Falls, taken from the base.